Over the last decade, I have developed a penchant for getting rid of stuff. I do not lead an austere life, but I appreciate simplicity and order very much. I don’t have a lot of furniture, books, CDs, dishes, clothes, papers, or many other things that some people seem to collect or, at least, have difficulty controlling. Part of this comes from the fact that I am only 25 at the moment, and so have not had as much time as some have to accumulate a depressingly large collection of material. Another part comes from the fact that I haven’t ever been a junk collector, and I’ve always liked being organized. I haven’t always consciously desired not having stuff, but I’ve always leaned that way. Last Wednesday, I got home from a three-week visit to my parents’ house in California. While I was there, I tried to take the opportunity to get rid of a few things that have been stored there in my absence (since last July). I didn’t intend to do much of that at first, but when I got there, it struck me as being very important especially that I not burden other people with my stuff, beyond my desire not to burden myself with it in the first place. I even have some things in a storage unit that my aunt is graciously letting Courtney and me use part of for free—I didn’t even know our stuff had been moved there until this trip, since I wasn’t part of the moving crew (it was done for us after we moved to Virginia). As evidenced above, I’ve never been a self-storage-using sort of person, so having even a few boxes in storage is unnerving to me, though I definitely appreciate the convenience of it and the generosity of the people who made it happen with zero effort on my part. My parents have also been going through the same get-rid-of-stuff process, though they have more stuff than I do by somewhere between one and two orders of magnitude. Their task seems much more daunting than mine does, especially to them. We talked a bit about this very thing while I was out there during this recent trip. So, I thought, why not compile a basic set of rules that I would follow if I had that much stuff to get rid of, and pass it on to them and anyone else interested? It seems to me that collecting a bunch of things that you don’t know what to do with, which then causes you to need more and more storage space, is analogous to getting fat. To qualify that assertion, let me say that I don’t mean that you should never buy or otherwise obtain new things. But, like consuming food, it should be done in moderation. If you eat more than you need, you get fat. If you continue to do so, you become obese to the point of being disabled and in danger of death. While having way too much stuff doesn’t put you in the same kind of physical danger or create the same type of inconveniences, it is easy to see the parallels. Consider for instance how someone under a strenuous exercise regimen might legitimately consume perhaps 4,000 Calories per day, whereas if I ate that much, I would gain excess weight at an alarming speed. This is similar to the phase of life that parents go through while they have children; obviously, it is necessary to have more things to accommodate a developing family of five than a newly married couple, or than that same married couple after their kids have grown and moved out. If our example person stopped exercising, he would certainly need to cut back on his food consumption or risk terrible heath. Decide what to get rid of. Decide how to get rid of it. These decisions are often so hard for people that they will actually pay someone else to make them on their behalf. Companies like 1-800-GOT-JUNK exist for this reason. You may have seen people with this same problem on Extreme Makeover: Home Edition. People become too attached to their things, or they simply don’t know how to approach a problem that seems so massive. The longer they put it off, the more massive it becomes. The first decision is definitely the harder of the two. I will assume for the sake of my rules that you want to get rid of things because you want more space, and not because you want more money. Money is sometimes a convenient byproduct of getting rid of stuff, but if you are only willing to sell things to get rid of them or you are only looking to get rid of things that are worth some notable amount of money, you probably won’t make much visible progress unless you happen to be liquidating an art gallery. If the desire to recoup your original investment is secondary to your goal of simplicity and orderliness, the whole process will be less complicated and more efficient. So, if I were faced with the same collection of stuff as my parents have, here are the basic rules I would follow to eliminate the excess. Not all of these are absolute rules, but if you can manage to follow them 95% of the time, you’ll be much better off. (I would like to point out before going on that my parents are not stuck and/or helpless in the battle against their stuff; they have been making progress for quite some time. They just want to make progress faster, which is what prompted me to write this.) There are general principles as well as rules for specific kinds of junk, since applying general principles isn’t always easy. Getting rid of stuff is really liberating. If you have a lot of stuff, it’s like having a ball and chain. You cannot move around easily. It takes time and effort to keep it organized and maintained, or if it isn’t perfectly organized, it takes time and effort to find things in the mess if you need to. It’s a psychological weight, even if you don’t need to look through it on a regular basis. Getting rid of stuff decreases your overall responsibility and gives you freedom of movement, not to mention less clutter and more space. Keeping something because you think you might use it is not worth it. One of the hardest hurdles to overcome is the desire to keep something because you might have a use for it one day. If you value simplicity and order, this is a more costly approach than getting rid of everything and then just re-buying things that you really end up needing. You will probably discover that you don’t miss having any of that stuff. Empty space is refreshing and motivating. Nostalgia and sentimentality are not friends of simplicity. This is another really difficult hurdle. 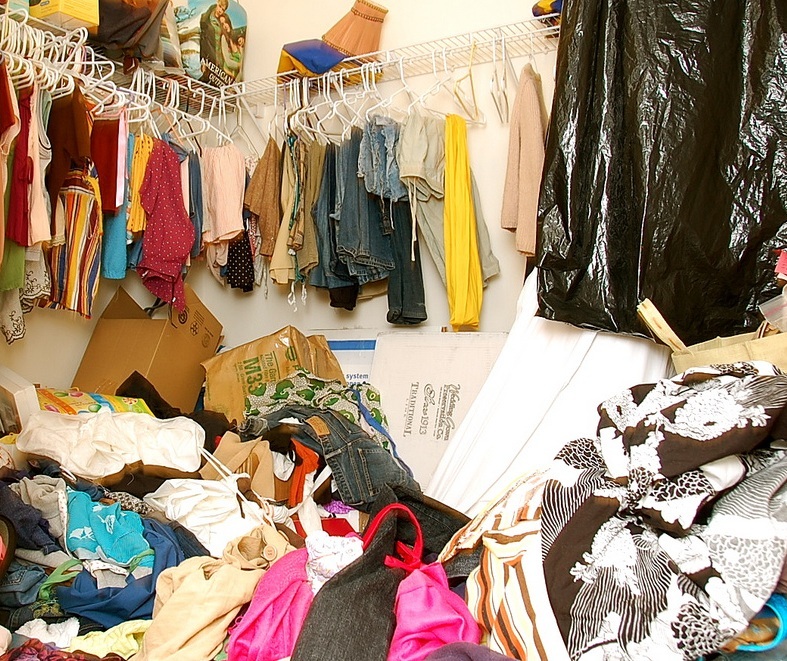 If you collect gifts, cards, children’s schoolwork, baby toys, or anything like that, it can be hard to get rid of them even if you can openly acknowledge that they have no practical use. It’s emotionally worthwhile to keep things if the sentimental value is truly large enough. That is something only you can decide. But think about who will be able to enjoy it, and what will actually happen when those people are no longer alive (a morbid thought, I know, but it is important). If it’s going to gather dust for 50 years and then end up in an estate sale, you might consider saving your offspring the trouble. 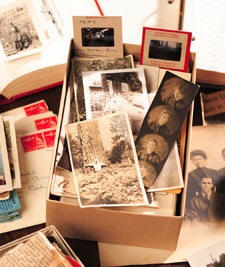 You might also consider digitizing sentimental things and getting rid of the physical objects, so the memories remain but the space is reclaimed. If you don’t want it, get rid of it. Let’s start with the obvious. Voila, problem solved! This is not usually a difficult choice most people have though. If it belongs to someone else, give it back. If you borrowed or rented something, return it to the person who owns it. Let them deal with their own stuff. If someone else could benefit from it, give it to them. Often, other people can find good uses for the things you no longer need. However, this is not an excuse to pawn off your stuff on other people who have a junk problem. The idea is to continue the useful life cycle of something if possible, rather than simply getting rid of it. If you haven’t used it in over a year, get rid of it. If you never use it, then you might not need it. A year is a good benchmark, though of course there are exceptions. Reclaim the space now, and if you need it or something similar again at some point in the future, get a new one. You may never need it. If something has been in a self-storage unit for over a year, get rid of it. Once again, you probably don’t really need it if you never use it. On top of that, think about what you’re paying for the storage unit. An average-size unit can easily run for $100 per month. What would you rather be doing with that money? If you don’t like how it fits, it goes. If something doesn’t fit, you won’t wear it often enough, or at all. It will continually get passed over when you pick outfits, and will eventually be relegated to the back of the closet or even a box somewhere. If you don’t like how it looks, it goes. The exact same reasoning as the previous rule applies here. Just get rid of it. If you haven’t worn it in over a year, it goes. This is a little more difficult, but the same principle applies to clothes as to anything else. If you don’t use it, you probably don’t need it. Additionally, with clothing, styles change rapidly, and older clothes may not fit the style you like. Get rid of it, and get something new when the need arises. Cleaners and old chemicals should be minimized. Old chemicals are not only ugly, they could also be health hazard. It is rarely necessary to have many strong chemicals or cleaners on-hand for normal household use. If you have a large collection, consider paring it down a bit. If extra paint is more than a year old, get rid of it. The older paint gets, the more difficult it is to work with. If you’re keeping paint for a specific project, then just do the project and be done with it. If you’re keeping it just in case, then it should go. If it isn’t already designated for a specific project, just get rid of it. 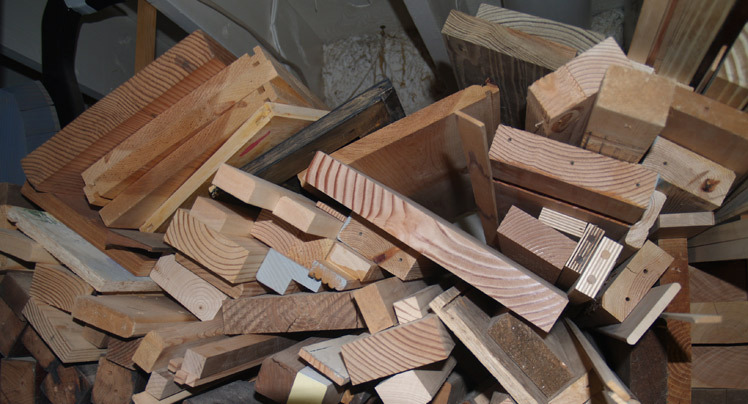 Raw materials are great to have on hand if you need them for something specific. But keeping them just in case you need them is a waste of space and, often, a psychological burden. It’s worth it to get the space back and the clutter gone. If it is designated for a specific project, get it done! It doesn’t do any good if you bought all of the wood to build a fence…ten years ago. Either use the material, or get rid of it. Simply declaring that something has a purpose is pointless (and demoralizing) if that purpose is never fulfilled. If you’ve already read it, get rid of it. Unless it’s that very special kind of book that you know you will want to read over and over again, how likely are you to read it again? Probably not very. Save the space and get rid of it. If you need it for reference, consider getting an electronic copy instead. This works very well for device manuals and how-to books. 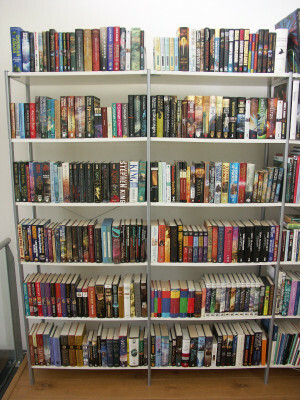 You can buy or find legitimately free copies of all kinds of books. Try Mashable’s list of 20+ Places for Public Domain e-Books to get started. Try finding the same information online to eliminate the need for the book. The internet is your friend. You can find virtually anything, even really obscure stuff. If you’re keeping a 200-page book because of five pages of important info, it might be readily available online. If it is, bookmark or save it, and then just get rid of the book. If you’ve had it for years but haven’t “found time” to read it, get rid of it. Unless it’s really important and out of print, it’s far more liberating to get rid of it and then buy a new copy if and when you need or want it again. You might never notice its absence. If someone else wants it, give them your copy. Recycling books to other interested people is a great idea. You probably won’t be able to do it on a large scale because of the time required to match books with interested new owners, but you might be able to make a few people happy without much effort. Think about the interests of people you know and the books you have, and make some offers. If it’s a VHS or 8mm video tape, convert it to digital video. If you don’t have the hardware to do this, services such as Digital Pickle will do it for a fee. Magnetic tape media deteriorates rapidly compared to digital video, so this should be done as quickly as possible. Keep it stored on a hard drive, or burn it onto a DVD. If it’s a cassette tape, convert it to digital audio. The same principle applies here (and the same company mentioned will do that, too). Digital media is easier to organize and much easier to keep intact. You can do this yourself with a tape deck and an audio cable, or you can make it even easier on yourself with a Plusdeck 2c PC Cassette Deck (I have one of these, and it works beautifully). If it’s an LP or 45 record, convert it to digital audio. There are services that will do this for you as well, or you can use a USB turntable . Once again, the key idea here is to convert analog to digital, then toss the analog copy. Digital media takes up far less space—virtually zero by comparison, if you store it all on a few ginormous hard drives. If you have a huge DVD collection, consider Netflix instead. Depending on your movie collection, this could be a massive change. Consider how much space you could recover and how much money you could recoup if you sold all of your movies, and then just used Netflix to watch what you actually wanted to see. Their average plan is less than $15/mo and gives you access to thousands of watch-instantly movies and TV shows, and just about every other movie ever made available for free shipment both ways and unlimited borrowing time. It’s almost impossible to beat. 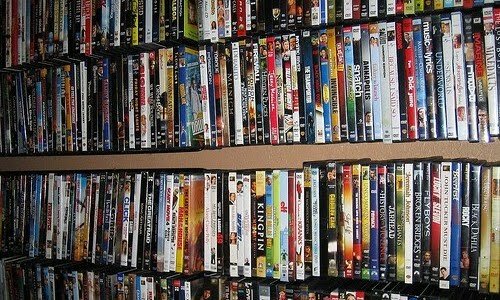 If you have 200 DVDs, how many will you actually watch, ever? If you’ve seen them once, how many will you watch again? If you sold them, how much would you get back? 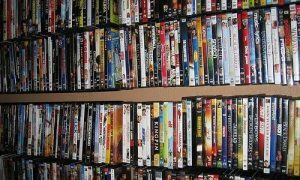 Netflix is a great alternative to building a physical movie collection, especially considering that most media services are moving towards an instantly available subscription model anyway. Do you really want to buy every movie again once Blu-ray becomes the everyday standard instead of the expensive option? I didn’t think so. Digitize anything important, then get rid of it. I go paperless whenever I possibly can. If it’s an option, I use it. 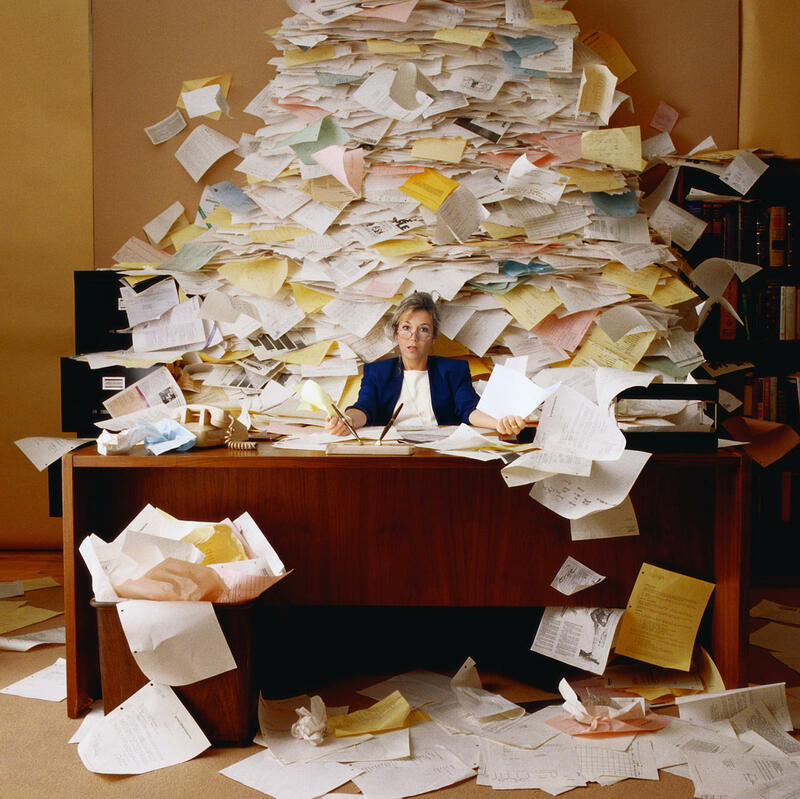 It’s far easier to organize a digital file than a physical one. However, if you don’t have the option, or you’ve accumulated a lot of papers that you feel the need to keep, you can at least digitize them. Get a flatbed scanner and set aside some time to scan the papers. Just do a few a day, or pick one stack and go through it. Recycle or shred them after scanning. Shred anything unimportant yet sensitive. This one is kind of obvious. I use the Aurora AS890C 8-sheet shredder , and I have no complaints. It shreds anything I throw at it, provided it’s eight or fewer sheets at a time. The basket is a nice feature. Any decent shredder will get the job done. You shouldn’t have any excuses for keeping sensitive but otherwise unimportant papers around. Shred, then recycle them! Again, this one is obvious. If it isn’t important and it isn’t sensitive, recycle it. That’s right—only one rule. Unless the photo has real monetary value, there is no reason to keep a physical copy when digital media is so cheap these days, and scanning is easy. Just get a flatbed scanner , as mentioned above, and scan them. You may want to look for scanners that allow slide or negative scanning as well, if you need that functionality. Once scanned, you won’t need to worry about photos losing their coloration due to temperature or moisture, and you won’t have to store them anywhere. Whew. Okay, remember, these aren’t absolutely strict rules. You probably shouldn’t follow them 100% of the time, since there are definitely valid exceptions (in the midst of significant life changes, moving, death in the family, inheritance, etc.). But most of the time, this will really help. But what about the other decision? How do you decide how best to get rid of something? Sometimes, people can decide what they want to get rid of, but they don’t know how, or they are stuck on the idea of getting some money back for their hard word and/or presumably valuable stuff. This is a difficult idea to overcome. Certain things lose their value extremely quickly, and others just have very little resale value in the first place. A garage sale is easy for a large quantity of items, but provides the least exposure and income potential. craigslist, an online classifieds site, offers good local community exposure and decent income potential, but requires more work for each sale (email or phone communication). eBay offers the best exposure and maximum possible income potential, but requires a tremendous amount of work to sell individual items unless you have an assembly-line-like process for photographing, describing, listing, and shipping every item. Trying to list everything on eBay is way too difficult unless you plan to make a business out of it. Craigslist offers a far better return-on-investment for most items. Only use eBay if you are convinced that you need maximum exposure. Rare antique items may fall into this category. Use a garage sale if you want to move lots of stuff quickly, and don’t mind a smaller profit. If it’s hazardous waste (paint, chemicals, etc. ), take it to an appropriate waste facility. If it’s recyclable trash (cardboard, shredded paper, etc. ), take it to an appropriate recycling facility. If it’s trashed computer hardware (displays, drives, I/O cards, keyboards, mice, etc. ), take it to an appropriate tech junk facility. If you expect to make less than $20 on the item (or set of items), give it away instead. The time you save is worth it. If you expect to make $20 or more, try to sell it once on the appropriate venue. If it doesn’t sell, give it away instead. I value my time highly. If it takes me 30 minutes of time to sell something that will only make $10, it’s not worth it to me, and I’ll just give it away instead. Whether you have a fixed dollar amount on your own time or just a general gut feeling about whether or not it’s worth it, it’s important to realize that some things just aren’t worth selling. Pick a local thrift store or charity and donate the stuff instead. You might make more with a tax write-off than you would selling it even if you put in the time, and the result is instant—your stuff is gone, and you never have to deal with it ever again. That, dear readers, is my goal. Don’t collect stuff, and don’t keep stuff longer than you need it. Don’t get too attached to your stuff, and understand that simply not having stuff is quite valuable in itself. Nice. Jess and I could use some of those tips. I might add that the fireplace works really well for sensitive papers, and it’s cheaper than buying a shredder. Oh, wait, you don’t have a fireplace :-). Jeff, this was the most wonderful article I have read in a long time and I have printed 4 copies of it to give to certain family members who desperately need the advice! Thank you, Nancy! I really appreciate that! Glad I could help. My husband passed away in March 2009. His double garage is filled with mostly materials of no value except for tools which he has accumulated over the years and from his Grandfather. Every time I walk into this garage I feel helpless and don’t know where to start. I would like to convert this to a single garage with an extra bedroom and laundry room. I don’t have anyone to help me and I am 70 years in age, physically reasonably capable of light work. with a brain that thinks I am still in my 40’s. I am sorry to hear about your husband. Dealing with all of the stuff left in the garage all by yourself would be daunting for sure. It sounds from your description of yourself like you would probably be able to take care of everything yourself if you had a very clear list of steps. 1. Are you emotionally attached to any of it? If so, that’s okay, but figure out why and whether it is worthwhile. Once you have decided that, separate out the things you can’t bear to part with (if any), leaving the rest to be dealt with different. 2. Do you just want it gone, or are you looking to sell some to make money? If you just really want it gone, then your fastest option is a trip (or multiple trips) to a local donation center followed by one to the dump. Depending on the type (an weight, mostly) of the materials, this might be difficult for you by yourself. You might also advertise a garage sale and list the basic materials and tools available, and sell everything for really cheap (or give it away). This will remove the need for you to do some of the hauling yourself. If, on the other hand, you are looking to make some money, I would start by separating out the things you decide you want to sell. Then give/throw the rest away as described in the previous paragraph. For the remaining “to sell” items, try craigslist, unless they are very unique and valuable, in which case you can try eBay first. Just try not to get too hung up on the idea of recouping your investment. Old tools are often very well-made and have good value to people who appreciate them, but it might be difficult to find those people. Unless you’re really hurting for money, try to keep your eye on the goal of emptying the space and converting it to an extra bedroom. 3. Are you willing to spend money to get rid of it? For speed and convenience, this would be the easiest choice for you. Companies like 1-800-GOT-JUNK will come straight to your house and take away everything you tell them to for a fee. A comment I saw from 2009 says their price ranges from $100 to $500 depending on how much of their truck you fill. 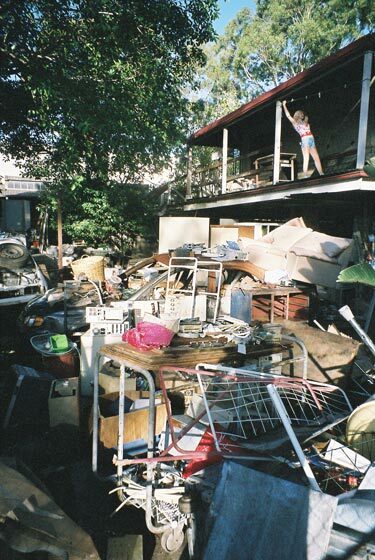 1-800-GOT-JUNK and possibly others will also give you a free estimate after they come to your house and see your stuff, so you don’t have to hire them if their quote is too high. You won’t make any money from this arrangement, obviously, but it is undoubtedly the simplest and fastest option. You might want to pick out a few things you can sell yourself, then have a service like this deal with the rest. I hope this helps! Good luck with your remodeling efforts!